Compulsive hoarding is a disorder that is commonly linked with obsessive compulsive disorder (OCD) and can lead to numerous complications in a person’s life and even lead to severe health problems. places they spend the most time in are consumed with ciaos and clutter. According to www.psychiatry.ucsd.edu, common types of functional impairment that compulsive hoarders experience include, fire or health hazards caused by excessive clutter, infestations, inability to have guests over to the home, inability to prepare or eat food in the home, inability to find important possessions because of clutter, inability to finish tasks on time, and interpersonal conflicts caused by the clutter. Behavioral treatment can help you overcome your compulsive hoarding problem. Although compulsive hoarding is commonly seen as a type of OCD they are different and the treatment for hoarding will be different than that of OCD. 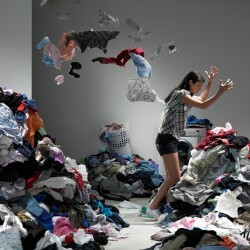 According to www.ocfoundation.org, compulsive hoarding has not responded well to the usual treatments that work for OCD. Cognitive behavioral therapy administered by a behavior therapist has been shown to have the highest success in treating compulsive hoarding. Medication may be administered but hands on therapy out in the community, slowly accomplishing small tasks, tends to help people overcome their hoarding disorder more effectively. According to www.psychiatry.ucsd.edu, cognitive behavior therapy uses the technique of exposure and response prevention to improve compulsive hoarding symptoms, which decreases excessive fears of making decisions, losing important possessions, throwing things away, and organizing saved items out of sight, by gradual exposure to tasks that provoke these fears. Over time cognitive behavioral therapy will help a person deal with their anxiety and lesson their compulsive needs to purchase or get free items that they do not need. Although there are medications out there that can help a compulsive hoarder deal with their anxiety or depression, medication is only a short term fix and the person will most likely revert back to hoarding if they do not deal with their compulsive urges. Both medication and behavioral therapy can be used to treat compulsive hoarding, but out of the two, behavioral therapy is the most effective and should be considered for any person suffering with a hoarding compulsion.